There's all sorts of facts, information, and trivia here. 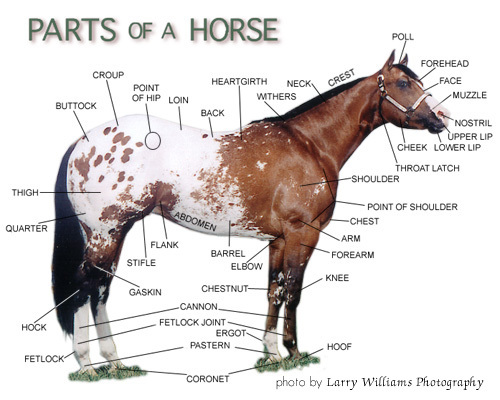 From general horse facts, facts about a horse's body, pregnancy and foals, horses in the wild, how to get to know them, history and quirky pieces of horse information, there are things here that just might surprise you. Around 75 million horses are alive in the world today. Horses first evolved in the Americas but they became extinct until the Europeans reintroduced them. It's true. Horses began to evolve on the American continent over 60 million years ago but they later died out. Lucky for us that they were reintroduced by Spanish settlers. The horse was reintroduced into the Western Hemisphere with the voyages of discovery by Christopher Columbus for Spain at the end of the fifteenth century. These Spanish steeds, derived from Moorish stock, first landed in the Caribbean in November 1493. The Spanish horses acclimated rapidly and within twenty years formed the chief supply for the Spanish mainland expeditions. Other European explorers brought horses to eastern and western parts of the New World in the sixteenth and seventeenth centuries. English colonists imported European horses. In the British colonies as a whole, horses were valued for riding, hunting, and racing. In 1918, there were 27 million horses and mules in America. That date is the all time peak of the horse and mule population in America. 7.1 million Americans are involved in the industry as horse owners, service providers, employees and volunteers. 3.6 million and 4.3 million of those participated in showing and recreation, respectively, with some overlap in cases of people who participate in both activities. 941,000 people participated in racing in either a professional or volunteer capacity. 1.9 million people own horses. In addition to the people actually involved in the industry, tens of millions more Americans participate as spectators. The horse industry directly produces goods and services of $25.3 billion and has a total impact of $112.1 billion on U.S. GDP (Gross Domestic Product). Racing, showing and recreation each contribute more than 25% to the total value of goods and services produced by the industry. The industry's contribution to the U.S. GDP is greater than the motion picture services, railroad transportation, furniture and fixtures manufacturing and tobacco product manufacturing industries. It is only slightly smaller than the apparel and other textile products manufacturing industry. All horses, regardless of when they were actually born, are considered to have a common birthday of January 1. Even if a foal is born on December 31st he or she will have their first birthday the very next day. The scientific name for the horse is Equus caballus. Equus comes from the Greek word for ‘quickness’. All horses (including zebras) belong to the genus equus. Ponies - Pony breeds are defined as being under 14.2 hands (one hand = 4 inches) or 58". Many pony breeds have developed in the wild and this has led to a natural hardiness that is not found in most horse breeds. Coldbloods - Usually refers to the large, bulky draft horse breeds, such as the Shire, Clydesdale, Percheron and Belgian. These horses are known to be docile and insensitive,and are often called gentle giants. Hotbloods - Usually refers to Arabians, Thoroughbreds and other horses of oriental origin. These horses are known to be energetic and sensitive, or hot. Warmbloods - Originally a cross between a hotblood and a coldblood, resulting in a trainable, athletic horse with good size and bone and are often used as a sport horse for dressage, jumping, eventing and so on. European breeders have warmblood registries that represent particular lineage, such as Hanoverian, Holsteiner, Oldenburg, Trakehner, Dutch Warmblood and Swedish Warmblood. These European horses are highly sought after in other countries, resulting in a large exportation market. A small indent in a horse’s skin (usually on the neck or shoulder) is called a prophet’s mark and is considered good luck. Some of the equine family's closest relatives are tapirs and the rhinoceros. Stallion is the name of a male horse older than four that has not been castrated is a stud or a stallion. Horses height is measured in units known as "hands." One hand is equal to 4 inches. The world record for a horse galloping over a short, sprint distance is 55 miles per hour. Horses only breathe through their noses. They do not breathe through their mouths. In fact, horses cannot breathe through their mouths. The average horse produces 10 pounds of saliva per day. A healthy adult horse should have a pulse of between 36 and 40 beats per minute while at rest. Horses can require up to 10 gallons of drinking water each day, and can drink at least 25 gallons of water a day or more. Horses tend to rely more on vision than smell. Their field of monocular vision is almost 360 degrees with a narrower field of binocular vision in front and slightly to the sides. Horses have a blind spot directly in front of the nose and directly behind them. They do have much better night vision than humans. 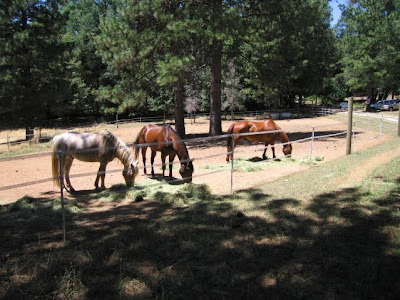 Horses have an advanced sense of taste which allows the horse to sort through grasses and grains to find the things that the horse would most like to eat. Horses generally will not eat plants that are poisonous, but when the horse cannot find more adequate food, the horse will eat plants that contain toxins. A horse's gut is designed to have food flowing through it almost continually, and horses graze most of the day if allowed. A horse only needs four hours of sleep per day at 15 to 20 minute intervals. The highest speed recorded for a horse's kick has been recorded at 75 mph. A horse’s hoof will grow about a quarter of an inch each month. A hoof is similar to a fingernail. 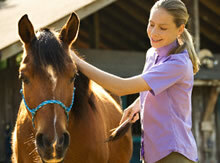 It grows constantly, and should be clipped before it becomes overgrown and causes distress to the horse. A horse’s knee joint is the equivalent to a human wrist, and their hock joint is equivalent to the human ankle. A mule is a cross between a male donkey (a jack) and a female horse (a mare). A hinny is a cross between a male horse (a stallion) and a female donkey (a jenny). Mules are known for having very long ears. Studies have assessed equine intelligence in the realms of problem solving, learning speed, and knowledge retention. Results show that horses excel at simple learning, but also are able to solve advanced cognitive challenges that involve categorization and concept learning. Perhaps one of the rarest colors of horse is the grulla (pronounced grew-ya) or grullo (grew-o), also known as the black dun, blue dun or lobo dun. The coat color is the result of the dun gene on top of a black gene, which produces individual hairs that are a mousy gray, smoky blue or slate gray color. Grulla horses can vary quite widely, from a distinctive smoky blue to a mousy tan. The Spanish word "grulla" refers to a slate-gray crane. Mares decide when and where the herd will go while the stallions follow. A blacksmith, or farrier or horseshoer, is a person who trims and shoes horse’s hooves. Hippo-sandals were used in the first century as a precursor to horseshoes. They were tied to the horse’s hoof with leather strings, rather than being nailed in place as is now done with horseshoes. The first patent awarded for the machine manufacturing of horseshoes was to S. Decatur and W. Tatharn when they received a patent for a horseshoe making machine in 1809. The machine did not succeed in production. In 1860, the total daily iron consumption for making horseshoes was 397 tons per day. 43 tons were used in machine-made shoes and 354 tons were consumed in making horseshoes by hand. Sons had six improved forging machines and they were capable of making six shoes per second. The turning point for the acceptance of machine made horseshoes was when the Burden Iron Company of Troy, New York, received a contract in 1861 to supply the federal government with large quantities of horseshoes to be used in the Civil War. This was the first large scale demand for machine-manufactured horseshoes and marks the turning point for acceptance of the machine manufactured horseshoe. The first successful horseshoe nail-making machine was patented by Thaddeus Fowler, who designed the first nail-making machine with pointed horseshoe nails. The brand name of the nails was "Vulcan". The New York Society for the Prevention of Cruelty to animals gave its endorsement in 1874 to the use of India-rubber horseshoes. They were made, lined, and worn like the rubber overshoe used by humans. The elasticity of the rubber shoe allowed the hoof to remain in its natural shape, while being protected from the abrasions of pavements. The rubber shoes were manufactured in sixteen sizes, weighed about 40% less and cost about one-third more than iron horseshoes. Outspoken anti-horseshoe advocates in England began arguing in the 1880's that 90% of a horse's foot trouble came directly from the use of horseshoes. The movement suggested using no horseshoes at all on the more than 2.25 million horses then living in the United Kingdom. The movement died because of it's impracticality. The US Calvary field-tested aluminum horseshoes in the 1890's. The report praised the ease of shaping, fitting and light weight but determined that the shoe would not wear long enough to be practicable for military service. Race horses: 2 to 4 ounces. The first horse lived around 50 million years ago and was called Hyracotherium. It had four hoofed toes on the front feet, three hoofed toes on the back feet and was about as big as a fox. Horses have been found in cave paintings that date back to around 15000 B.C. The first veterinarian text written that included a section on the horse's foot was written by De Arte Veterinaria in 430 BC by Simon of Athens. Chariot racing was the first Olympic sport in 680 B.C. The sole survivor of Custer's Last Stand was a buckskin named Comanche. Comanche had twelve wounds and spent a year in slings before becoming fully recovered. The US Cavalry headquarters allowed Comanche complete freedom for the rest of his life at Fort Riley, Kansas. Comanche was officially retired and it was ordered that no one would ever ride him again. He was called "the Second Commanding Officer" of the 7th Cavalry. His only duties were to be lead in the front of official parades occasionally. It is said he developed a fondness for beer in his later years, and was such a pet at the fort that he was often indulged in this habit. Comanche lived to the age of 29, and when he died his body was mounted and put on display at the University of Kansas, where it stands to this day. So everyone knows Silver was the Lone Ranger's horse, but what was the name of Tonto's horse? Tonto's horse was a paint named Scout. The largest number of horses ever assembled for a US movie was the 8,000 horses that were used in the movie War and Peace. How old was the oldest horse? So far, the oldest recorded horse on record was Old Billy who lived in England to a ripe old age of 62. Old Billy from Lancashire, England, was born in 1760 and died in 1822 at age 62. I repeated myself because I have a hard time believing it, even though its true. The Palamino horse we know as the talking Mr. Ed was in fact an American Saddlebred. Mr. Ed, the talking equine star of the 1960s television series, was a golden palomino. He learned an enormous amount of tricks for his role, including answering a telephone, opening doors, writing notes with a pencil, and unplugging a light. Apparently, Mr. Ed would occasionally have a fit of temper, as befitting his star status, and would stand stock still, wheezing and refusing to move. The world record for a horse galloping over a short, sprint distance is 55 mph. Riding a horse burns between 148 and 690 calories each hour, depending on the gait of the horse and the weight of the rider. The oldest pony ever recorded was named Teddy E. Bear. He lived to be 55 and was owned by Kathy Pennington of Virginia Beach, VA. He was still alive in 1998. The tallest horse ever recorded was the English gelding Sampson (also known as Mammoth). He was born in 1946 and by the time he was four-years-old stood seven feet two inches tall. The World's Largest Horse was a purebred Belgian stallion named Brooklyn Supreme. He stood 19.2hh (6'6") at his withers. He weighed over 3,200 pounds and is entered in the Guiness Book of World Records. He was foaled in 1928 and died in 1948. He lived in Iowa, USA. After reading all of this, you probably won't get fooled when folks ask you a question of two about horses. But then again, be careful. Remember, what runs all around a paddock but doesn't move - is a fence. The side of a horse has the most hair is in fact the outside. And yes, just in case some wise guy asks what kind of horse can jump higher than a house? Remember to tell 'em that all kinds of horses do -- since houses can't jump!